Select the checkboxes next to the tasks to export. In the header row, click download Export. In the dialog box, click the File format dropdown menu and select a format for your exported file. Next, select the properties you want to include in your exported file. Include only properties in columns: include only the properties currently set as columns on the Tasks dashboard. To customize the columns, click the Actions dropdown menu in the upper right, then select Edit columns. Select the checkbox(es) next to the properties to include, then click Save. Include all properties: include all task properties in your export. Click Export. You'll receive an email with a download link to your export file. 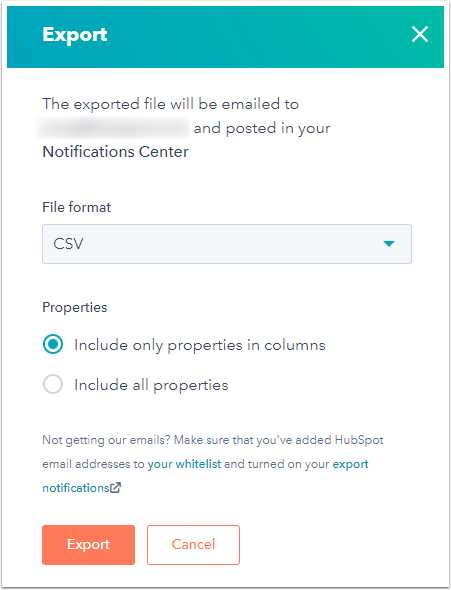 The Activity created by column in the export file refers to the user that is assigned the task. The Activity date column in the export file refers to the due date of the task, not the date where the task was created. The Associated with column cannot be exported.